I was writing a reply to a reader's comment/query and I found myself unable to stop writing. I figured I better make it a post instead! Here's to you and your envy-worthy shopping adventures my dear Anonymous reader from Singapore!!! Hi Anon! You officially made me palpitate with excitement! Jimmy Choos on sale! Waahh! I think I'm going to go crazy there! One word - Jealous. You really make me jealous!!! Debbie Co's clothes are classy and sophisticated. But she can definitely do fun and quirky just as well! I really love this girl! Because she is petite herself, she knows what is best for similarly framed girls like me. She just gets it you know. Sometimes I go to her with no concrete idea in mind, if not a thousand and one ideas swirling around all at the same time. And I always end up leaving with the perfect dress!!! Not to mention, her construction is faultless. My sister Nicole had her senior's ball dress made by her for their ball this weekend and Nic is one happy girl! Considering that the first fitting got her really worried because it didn't come out as she envisioned. She explained to Debbie how she wanted her dress to be and come next fitting, VOILA! It was PERFECT!!! The shop carries a ready-to-wear line as well, and she does alterations no prob! But if you see something that you like off the rack, and it doesn't come in your size, you can have it tailor made just for you! Apart from her own stuff, local designer products abound in her atelier -- from clothes (Crise de Nerfs by Mel Orlina plus some other labels), to shoes, bags and accessories (such as the D! jewelry line)! 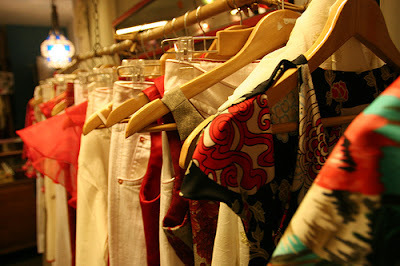 TIP: Do try on the ready-to-wear items hanging on the racks. They always always always look better when worn! I sometimes see girls pick out an item I would have glossed over, but once they fit it, it really looks fab! I swear I wish I picked it out myself! This is designer Richie Ortega's store. She carries both local and imported labels. While the stuff for sale are ready-to-wear, she makes tailored dresses and gowns as well. Very reasonably priced too! My future sister-in-law Leslie had her prom dress made by Richie and it was really well-constructed! She also happens to make exquisitely beaded items that are so fab, they are stocked at Lane Crawford and Harrods under the label "When I was Five". Candy Reyes and Yael Buencamino started as bag designers way before bag designing became the "in" thing to do. I knew Candy's sister Krie from work, and I remember going to Bel-Air just to check out their new bags upon her prodding. But really, it didn't take a lot of convincing because we would seek them out even after they moved to a little shop in Makati Avenue. Ishq finally found a home in Astoria Plaza, and evolved into a boutique that carried the works of local clothing and accessories designers (both up-and-coming and established! ), side by side their one-of-a-kind bags. Along with Richie Ortega of Souk, I believe they are the pioneers of "off-mall retailing". What is admirable is that they supported local designers by providing them a venue to display their wares -- when this concept was still unheard of. After these girls got a lot of press, a lot of young retailers got inspired and you can see a proliferation of quaint little boutiques popping up in the metropolis. TIP: There's a store right by Ishq called TONIC that carries shirts by Team Manila. Eileen Co (we call her Chico) and her friend started out with bags (Cole Vintage) as well, but have branched out to clothes and shoes that they themselves design. If you want laid back, easy breezy feminine pieces, their clothes are just that! They used to consign their stuff in boutiques across the country, sold on-line, and participated in bazaars, but Chico is opening a store in Serendra this March called MiaBella. I have yet to see the items they'll have in stock, but I'm sure Chico would have done well with the merchandising! This building houses several boutiques (Nullah, Tilka, AB Fit Jeans, etc.) carrying both local and imported goodies. If you like funky, edgy pieces, this is the go-to store! They stock shirts, clothes and accessories made by local streetwear designers. I hear they've got witty shirts with graphics like "I say chuk chak, You say chenes" or something like that. Fun, humorous stuff I'd think. I'd like to check out this store sometime soon actually! You completely "get" what I am trying to convey. What a joy- this ease of communication. I am soooooo definitely going to every location you recommended. I only have all of three days to shop, so having the benefit of this kind of 'focus' is a wonderful time-saver! If you are ever headed over here, write about it in your blog and I will comment with news or info on upcoming sales plus where to go. Being trendy/fashionable isn't my priority but having a strong sense of (current and personal)style is. hahahaha. I have a serious job in a serious workplace and deal with serious issues; so sartorial pursuits of the shallow sort thrill me. Those unconventional Danny Sullivan shoes are now available in Singapore. British footwear label Irregular Choice set up shop here in Jan/Feb.The shoes and boots are truly funky, to say the least. Strong statement-making, you know. The shop is at 49, Boat Quay. You have to call ahead to make a viewing appointment. This realy suits the underground character of the brand. You can also email them at irregularchoice.sg@gmail.com. Love Kooba bags - Made from as-soft-as-butter leather that are somehow also flyweight. They are sold here in Quintessential (at the Meritus Mandarin hotel)- at reasonable prices too, with hardly any price mark-ups from the retail price in the U.S. I hear this bag boutique mighthave to move/vacate as the Hotel mall is earmarked for renovation works. Perhaps a sale is in the plans???? Just had to share those titbits. Omg! I have a serious job in a serious company as well! But people, both in and out of the office, have been telling me I would fit in better in another industry, hahaha! (I don't know if I should take that as an insult, but I'd like to think they mean well!) Because like you said it succinctly, "sartorial pursuits of the shallow sort thrill me" too! Thanks for your generous shopping advice! I will definitely seek out your help when I have the opportunity to visit Singapore! Btw, I updated Souk's new address! It has moved to The Ramp, inside Crossing's Department Store in Shangri-la Plaza Mall, Ortigas Center. I suggest you first check out Store for All Seasons at Shaw Blvd. in Mandaluyong (its on the opposite side of Shaw Blvd., where Starmall is), then head off to Shangri-la where Souk is. The Ramp section, where it is located, also houses a collection of clothes by homegrown designers, but I don't think they've updated their merchandise in the last couple of months, last I checked. Ishq and Tonic, in Astoria Plaza, are also in Ortigas Center btw! You can also hit 2 birds with one stone when you go to Jupiter Street in Makati since Atelier Debbie Co is just down the road from Dona Consolacion Building! I tried shopping in Store for All Seasons and I love it! Coz it fits my fashion style. Although I have to warn people that the clothes are not for everybody. It can get really crazy! But if you're the adventurous type, go ahead! One of the onwers, Mich Dulce, crazy girl as well, is friendly and accomodating. Hey Tin, have you also tried visiting the "I Love You" store? Oh... also the Independent Lifestyles area in Rockwell has one of a kind stuff too. It's at the second floor. They're opening Souk too in Serendra I think, went there but it didn't open yet. What I really loved was the ILOVEYOUSTORE!!! It was the BEST place I went to while running about these kinda stores. The girls who run it are so charming and the place is just fabulous. Love the clothes - in fact, love everything! the iloveyou store is near jupiter as well, pillar avenue? www.fashionwillsavetheworld.com is their url I think. Wow! Thanks Cons for the tips, and Mooglie for the in-depth analysis of your shopping experience! Its like being there myself! as for SFAS, well I went there because of what I saw on michdulce.com :) and I do like mich's stuff, but like what I said, perhaps I was expecting too much of the store to yes, live up to its so called reputation, which is why I was mostly disappointed. Mooglie! What can I say! All the while I thought you were from here because you sound like a seasoned Manila shopper (which you really are as it turns out!)! Lucky you to have the best of both worlds! Singapore shopping is one of the best in my experience! I will definitely check out the I Love You store one of these days! You got me really curious about it now! Although I have tried Sonja's cupcakes (I like the peppermint patty), I've never had that chocolate cream pie! Another thing to add to my must-do list! Thanks mooglie! Your enthusiasm is infectious!!! It's been awhile since I went to SFAS... maybe too much consignments already without considering the quality anymore. Excited to check out ILOVEYOUSTORE! As soon as I recover from some of my wedding expenses. Hehehe! hi there. just discovered your site. its wonderful. i stumbled upon my name in your entry about Debbie Co's atelier. I do not sell my jewellery there (or anywhere). My jewellery is only directly available through me -- through my flickr site. I think you may be referring to another line called "D!" -- which are really cute baubles (i own some myself). I know the girl who makes "D!" and she has a wonderful collection. thanks! Thanks for the clarification Daphne! Your designs are really nice, especially the charm necklaces =) I've seen your Lanvin-esque pearls as well, my best friend and your colleague Nina Corpuz has those! I actually met you before a long time back, sometime 1999 in Enterprise Makati, you were with Nina. I don't think you remember me though, it was such a long time ago. Thanks for visiting my blog too! oooh that was a while ago. what were we doing at enterprise? i dont make those lanvin pearls anymore. i do medallions and charm necklaces, set in 14k gold or silver. thanks. nice blog. Lovely necklaces! You must be a superwoman juggling family life, a career, and a hobby such as jewelry making with aplomb!!! I am new to the world of fashion blogging. I Love your site.Check out this spine tingling site I found. I saved 70% on designer wear. Awesome shopping! Its amazingly wonderful to know that more and more people are supporting local rtw designers. Its about time! Although I would suggest being extra discerning in choosing which pieces are worth their hefty price tags. Some shoppers that lack an eye for quality and have sub-standard aesthetic taste may be fooled, throwing their money away on undeniably over-priced items. Figuring out how much was actually spent in making a pair of pants, for example, helps. Working in retail and having a fashion designer mom - thus, familiarizing myself with product development and garment specifications - enabled me to do quick mental calculations in my head while shopping before I decide on buying an item of clothing. Over-priced ones are out of the picture. And believe me, there is A LOT of over-pricing going on out there. Im talking 500% of the actual cost! P.S. This is the only good local fashion blog I know of. Its the best one! Super sorry for the late reply, and major thanks for the compliment! =) I totally agree about looking for pieces that are really well made and priced reasonably and your picks are just that! I love all the brands you mentioned, you must have a good eye and I'm sure your mom and your experience trained you well! Thanks for the tips!